I recently bought ground turkey at Trader Joe’s. It was shockingly lean, so I had to add olive oil, and then add a little more, as I browned it with the vegetables to make this chili. Which is fine, of course, I’d rather add olive oil than have a lot of poultry fat in the dish. 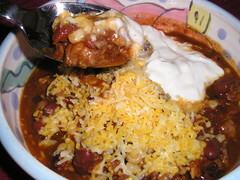 I used plenty of Chimayo chili powder, my favorite, and even a little powdered smoky chipotle I had on hand. I used up a yellow bell pepper, too. And of course started with plenty of onion and garlic. I’d just bought an ear of corn at Kerr’s Farm stand just outside of Pennington, on a tip from Za restaurant chef/owner Mark Valenza, and I put that corn in there too. It was excellent corn, and I wished I’d bought more. In went a can of pink beans and a can of kidney beans. A small can of Muir Glen organic fire-roasted tomatoes. A little shredded Mexican cheese blend, a little “light” sour cream, and I had several dinner and office lunches all wrapped up. Between the turkey and two kinds of beans, this is one of those lunches that keeps you from snacking during the afternoon. Don’t know why I don’t make it more often.